I have never put much stock in DreamWorks Animation Studios. The studio began as a lame attempt by Jeffrey Katzenberg to get back at Michael Eisner for passing him over for a promotion within the Walt Disney Company, and its first few films (Prince of Egypt and Antz) were obvious rip offs of Disney and Pixar’s (superior) product. Admittedly the studio has begun to find its footing with the Kung Fu Panda films and the superb How To Train Your Dragon (a film I loved so much I placed upon my Top 10 of 2010). But for every one of those great works there’s a Bee Movie or a MegaMind. And of course we can’t forget DreamWorks’ cash cow: the Shrek franchise. Puss In Boots is the latest attempt to milk the Shrek universe for all its worth but surprisingly the lack of imagination that plagued Shrek the Third and Shrek Forever After is completely absent. This film may take place in the Fairy Tale universe but it barely feels like it has any connection to the land of Far Far Away. There are no cameos by the Gingerbread Man or the Three Little Pigs, nor are there any offhand remarks about Shrek or Fiona. The producers don’t even explain whether or not this takes place before or after the other four films. The result is a refreshing change of pace for Antonio Banderas’ Puss. He’s front and center doing his own thing and making the most of the spotlight. The story centers around the titular hero’s journey to find magic beans that will grow a beanstalk leading to the realm of the golden goose. Puss doesn’t seek out the gold for financial gain but rather to pay off an old debt and find redemption in order to clear his name. The crafty feline is joined by childhood friend Humpty Dumpty and the femme fatale Kitty Softpaws in his search and pursued by the odious Jack and Jill; treasure hunters who want the goose for themselves. The story is pretty straight forward and kept afloat by brisk humor and plenty of action set pieces. Animation proves to be a fantastic medium to explore kinetic action sequences and Puss in Boots takes full advantage of this. The flick also takes advantage of specific sight gags and jokes only possible with animated characters. The producers are wise to lay off the pop culture references and make more character driven humor. The result is a timeless tale that will age much better than the joke-a-minute animated films like Shrek and Aladdin. 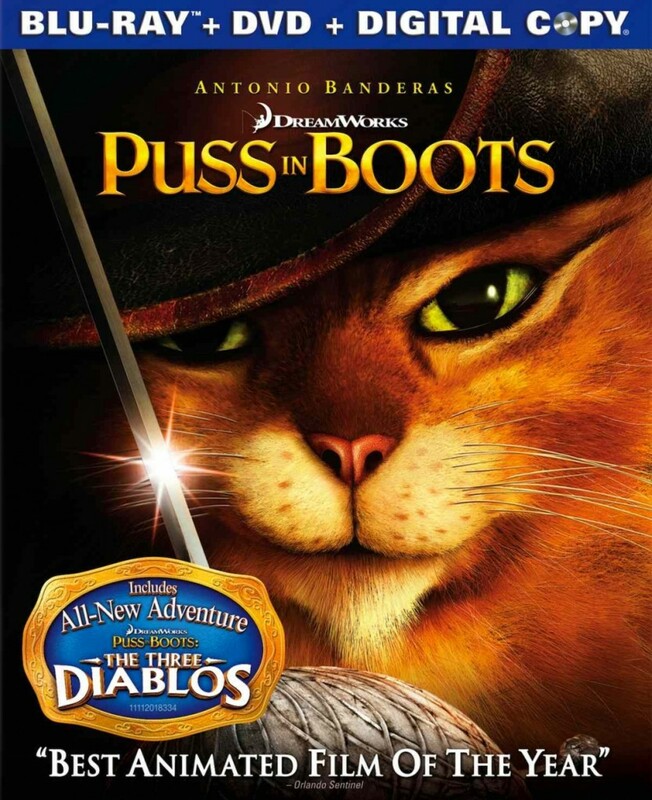 Puss in Boots isn’t a home run like How To Train Your Dragon was, but it is a solid triple. DreamWorks could use more of these, and I hope this a sign that they’ve really gotten their act together. Puss In Boots is available on BluRay right now. Comments for BluRay Review: “Puss In Boots” are now closed.